Nambucca River District Agricultural Assoc Ltd - Expression of Interest to Purchase the Macksville Showground. The Performance Targets for quarter to 31 January 2012 are circularised. That Council note the extent to which the Performance Targets have been achieved for the quarter ending 31 January 2012. The Nambucca River District Agricultural Association Ltd has expressed an interest in purchasing the showground site (including the saleyards) subject to the payment of an annual subsidy of $35,000 if the saleyards are operational and $45,000 if the saleyard is non operational and subject to CPI increases. At this stage it is not considered that Council can formally respond to the offer from the Nambucca River District Agricultural Association until an audit of the Saleyards has been undertaken by the WorkCover Authority. 1 The Nambucca River District Agricultural Association Limited be thanked for their expression of interest in purchasing the Macksville Showground. Further the Association be advised that Council is endeavouring to determine the work required to make the Saleyards environmentally and OH&S compliant, following which there will be further discussions with the Association in relation to their offer. 2 WorkCover be again requested to undertake an audit of the Macksville Saleyards. There are no real options. Council needs to determine the capital expenditure requirements for the Macksville Saleyards for the short to medium term. Council considered a report on the future of the Macksville Saleyards at its meeting on 6 October 2011 (attached). At Council’s meeting on 6 October 2011 it was resolved to defer a decision on the future of the Macksville Saleyards for a period of four months (GPC meeting in February 2012) until a decision from the Showground Committee is provided to Council in time for inclusion in the report to Council for that meeting. Subsequently there was a meeting on 7 December 2011 between the Association executive and Council staff and a letter was forwarded to the Nambucca River District Agricultural Association on 9 December 2011 (attached). Council has now received responses from the Nambucca River District Agricultural Association which are attached. The annual subsidy is based on a strong preference for the saleyard to be operational and environmentally as well as OH&S compliant at the point of sale/purchase. The Nambucca River District Agricultural Association Ltd also advise they cannot guarantee the long term future of the Saleyard, post sale, nor in the short term should new legislation requirements be prohibitive or an unforeseen expense be incurred. In 2009/2010 Council budgeted for a net cost for the saleyards of $26,300. In 2010/2011 a provision of $129,100 was made to attend to identified risks (effluent and OH&S) which meant the budgeted net cost was $149,400. In the end a budget allocation of $100,000 to attend to risk issues was directed to Council’s deficit and the Saleyards budget for 2011/2012 has returned to a more “normal” deficit of $13,300. Based on these figures, the offer put forward by the Nambucca River District Agricultural Association Ltd to attend to all of the maintenance and capital requirements of the Showground, including the Saleyards, is reasonable. However the offer is conditional upon the Saleyards being environmentally and OH&S compliant. Council is aware that without an effluent disposal system the Saleyards are not environmentally compliant. Further until an audit is undertaken by WorkCover, the status of OH&S compliance is uncertain. The previous audit undertaken by Holmes and Black which lists non-compliances has been disputed by a number of people who use the saleyards. WorkCover can provide a definitive assessment. At this stage it is not considered that Council can formally respond to the offer from the Nambucca River District Agricultural Association until an audit of the Saleyards has been undertaken by the WorkCover Authority. The local office of WorkCover has advised that a response to Council’s request will be issued by their Sydney head office. There has been consultation with the Nambucca River District Agricultural Association Limited. In terms of risk to Council as measured by likelihood and consequence, the Macksville Saleyards is no. 3 in Council’s Risk Register after a drought secured water supply and the possible restructuring of NSW water utilities. As you are aware Council has considered the ongoing operation of the Macksville Saleyards in light of increasing OH & S and environmental obligations. One option considered by Council was for the sale of the Saleyards, which is in effect, a Sale of the Showground in its entirety. It is considered that the only feasible purchaser in this regard is the Nambucca River District Agricultural Association (the Association). This letter is submitted to invite an expression of interest from the Association for the purchase of the freehold title comprising the Macksville Showground (and including the Macksville Saleyards). Council resolved at the ordinary meeting on 06 October 2012 to defer further consideration on the future of the Macksville Saleyards until February 2012 to enable the Association sufficient time to complete due diligence enquires and to respond to Council. 1 A copy of the current insurance schedule for showground and Saleyard infrastructure and improvements, including the current replacement values. 2 An indication of the future rating liability of the property under the Association ownership. 3 A copy of the current rates notice for the property. 4 Details of the mechanism for a legally binding agreement between the parties as to ongoing operating subsidies and the length of any such subsidy. 5 An estimate of the cost of grounds maintenance. 6 Details of the possibility or otherwise of continued us of Council plant and equipment similar to current arrangements. 7 Suggestion for the legal mechanism to protect the interests of the Rusty Iron Rally asset on the land. 1 Provide all OH & S manuals and systems in place as at the date of Transfer. 2 Provide details of the Traffic Management Plan available at the date of transfer. 3 Advise of Council will continue to undertake inspection of amusement devices at the Annual Show. 4 Provide details of the use of part of the Saleyard facility as a stock pound. 5 Provide full details of Council’s records regarding the actual or potential contamination of the site, noting that as far as Council is aware the site is not contaminated not has it been used for any purpose that would give rise to possible contamination. 6 Whilst a matter for Council, staff will recommend that the legal fees arising from the transfer be met by Council. I will forward the above information immediately it comes to hand. 1 That Council note the establishment of an autonomous Macksville Saleyards Advisory Committee and advise G J Kennedy & Co Pty Ltd that Council’s Business Development Manager, Mr Wayne Lowe will attend meetings of the Committee as Council’s representative. 2 That the newly formed Committee be advised they are autonomous of Council and have no delegated authority to act on Council’s behalf. 3 That Council not convene meetings of its own Saleyards Advisory Committee in lieu of the establishment of the autonomous Macksville Saleyards Advisory Committee. Council can continue with the existing Saleyards Advisory Committee, delegate powers to the proposed Committee, or alternatively not delegate any powers. The last option is the best fit for a Committee which has been established by G J Kennedy & Co in accordance with a Code of Practice which states that the saleyard operator is responsible for the coordination and continued functioning of the Committee (not Council). At Council’s meeting on 2 February 2012 it was resolved that a report come to Council on the composition of the Saleyards Advisory Committee and the provision of delegated power under Section 355 of the Local Government Act. Council subsequently resolved to appoint Mr George Hicks OAM to the Macksville Saleyards Advisory Committee at the Ordinary Meeting of Council on 16 December 2010. The proposed Macksville Saleyard Advisory Committee put forward in the attached correspondence has two representatives in common with the Committee established by Council being Mr Tom Stanton plus the request for Mr Wayne Lowe, Manager Business Development to participate on the Committee. There is no representation from Councillors. Under the NSW Local Government Act, Council must delegate responsibility under Section 355 if it seeks to provide a Committee with authority to act on its behalf. Alternatively, as suggested in the letter, the proposed Committee could operate autonomously from Council without any delegated authority to act on behalf of Council. As the owner of the facility, the Council remains ultimately liable for the Saleyards. However it is a positive step that the Operator has taken the initiative to establish the Committee and consider the requirements of the Australian Code of Practice. The Mid North Coast Local Health District Board (Mr Warren Grimshaw AM, Chair of the Board and Mr Stewart Dowrick, Chief Executive) will make a presentation to Council in relation to health services in the Nambucca Shire. That Council thank Mr Warren Grimshaw AM, Chair of the Board and Mr Stewart Dowrick, Chief Executive from the Mid North Coast Local Health District Board for their presentation to Council in relation to health services in the Nambucca Shire. On 6 July 2011 Mayor Hoban met with the newly appointed District Board (Mr Warren Grimshaw AM, Chair of the Board and others) at the Macksville Hospital. At this time the Mayor invited Mr Grimshaw AM to address Council at a future meeting in relation to health services in the Nambucca Shire. The invitation was accepted. This report has no effect on the environment. There is no social impact as a result of this report except that Council and residents of the Nambucca Valley will be more enlightened as to the provision of health services in the Nambucca Shire. There is no impact on the economy as a result of this report. There is no risk to Council as a result of this report. 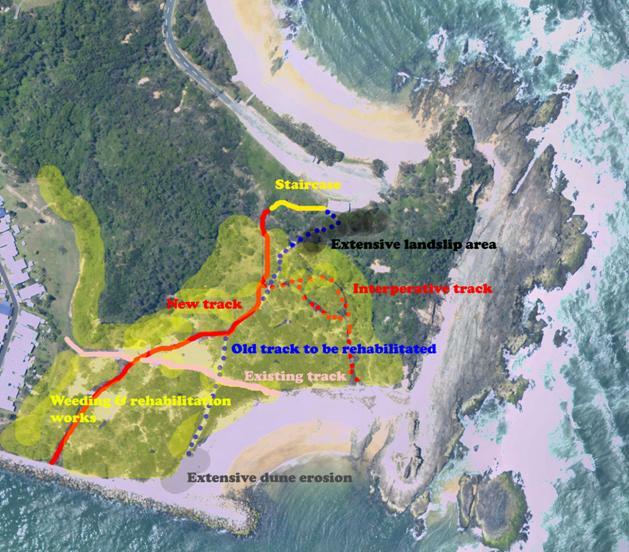 However, as there has been considerable community confusion and misinformation circulating about the walking track, along with several submissions being received, it is proposed that Council include a site visit so that it is fully aware and informed on this Our Living Coast project and the exact location of the proposed new track. · Department of Lands (Coastal and Infrastructure) - requires access from the car park and along the breakwall to carry out remedial work. This could involve moving painted/rocks/armour from the river side of the breakwater as well as replenishing rock at sites of damage/instability along the breakwater. This would require traffic management to exclude the general public while work is being carried out. · Emergency vehicle access is required along the breakwall. This will require the relocation of the first bench seat and the first light pole to allow sufficient width for a motor vehicle. A small cleared and grassed area is to be provided near the eastern corner of the caravan park to allow an emergency vehicle to turn around. · The helipad should be a mown grassed cleared area. A marked emergency vehicle pullover bay is provided adjacent to the helipad and remain clear at all times. · Recent land slip (February 2009) resulting in damage to first floor of a residential flat building in Wellington Drive. · Continued landscaping works to the rear of properties in Wellington Drive contributing to the risk of further slippage. · Tree poisoning along the Ridge Street area also contributing to land slippage. · Power boat/swimmer conflict – danger for propellers - strong currents. · Stairs to the beach near the start of the breakwall should be removed to discourage swimmers. · NESB visitors particular swimming risk. · Headland slippage towards caravan park in mid 1990’s – area has been rebenched, shaped and protected with mesh fencing. · Rock fall near bus area off Wellington Drive in June 2008. We were very disappointed to read that Council has approved this new track and is going to pay for it with funds from the “Our Living Coast” project. That project is to save not destroy and to let people see our marvelous coastline. Most Townships on the Coast do not have this wonderful buffer zone that we in Nambucca Heads enjoy. It is a track that will destroy an endangered ecological community listed in the Threatened Species Act – Themelda Grasslands, together with several Coastal Banksia trees some 20 or 30 years old which the Black Cockatoos feed on. We have planted two of these Banksia’s in our garden and it was not until they were about 7 years old did the Cockatoos start feeding on them. Any replacement trees will deprive these birds of food for many years. It is our understanding that under the NPWS Act and Threatened Species Act (NSW legislation) this precludes damage to listed endangered species, and “possible danger” is not a sufficient reason to over ride either act. I cannot understand how you have got permission from the Heritage Council. We can only assume that Council did not admit that this grassland is there. Yet another act of vandalism by the Nambucca Shire Council. Madam Mayor you should at least and go and see the grassland. To the untrained eye it looks like a fine lawn of a species of couch. Kara Smith from Dune Care did her thesis on this grass and was not allowed to cut even one blade for her studies. She is well qualified to comment and co-ordinates all the work we at Dune Care do making sure we only destroy weeds. We understand your weeds officer is familiar with the good work done by the Volunteers at Dune Care. There are already paths there that could be widened without destroying the grassland. Further destruction will occur by bike riders using this track once “bolsters” are placed there. In the unlikely event of a landslip closing Wellington Drive people in an emergency could be moved by boat or helicopter to safety. It is no different should a bush fire occur cutting off the Hyland Park Community. The vandalism that Council will incur by putting an unfinished track in, supposedly for “evacuation purposes” will be a track to no where destroying Australia’s Heritage and our Living Coast. We continually hear Council saying we can’t afford to do this and that to fix problems and yet you can find money to destroy. It’s amazing. At the February Council meeting, Council resolved to receive a report detailing what would be involved and the resources required in staff and finances for Council to develop a tree inventory. Council has responsibility for the management of large areas of public land including public roads, parks and reserves, land around public buildings and Crown land for which Council has the care and control. Apart from the physical infrastructure each of these public places has a wide range of trees and shrubs. In order to manage these natural assets Council will need to adopt a systematic identification and recording program for the development of an register. 1 That Council engage suitably qualified volunteers to assist with the tree identification in public reserves and playgrounds as a trial assessment to determine the time required to collect and correlate the data and determine the budget implications to complete the register for all areas. 2 That a further report be presented to Council on the trial assessment and budget implications for the development of a tree register. Council’s insurer, Statewide Mutual, has developed a Best Practice Manual for Trees and Tree Root Management (copy circularised for Councillors). The development of a tree register needs to be in accordance with this manual. The development and collection of the inventory is a very time-intensive process and Council does not have sufficient resources available to complete the process. The facilitate the implementation of a tree register, the Director Engineering Services has sought volunteer assistance through Mr John Tait and Ms Gwen Harden for the data collection and identification of tree species etc.. Council day labour through GIS and the Council’s Supervisor Parks and Reserves will be required to initially commence the data collection and train the volunteers on the use of the electronic data collection and use of the forms. The data compilation and development of the register also requires the assessment of the tree health and condition, possible habitat, risk/hazard to the public and any remedial or other actions required. This assessment would be carried out through Council’s Supervisor Parks and Reserves. There are no issues as a result of this report. However, the proper management of tree assets benefits the environment. There are no issues as a result of this report. Properly managed tree assets enhance the amenity of the area and hence social satisfaction. There are no issues as a result of this report. Trees can enhance the value of real estate and potential tourism income. There are no direct risks as a result of this report. The lack of a tree register and tree management process does pose a risk to Council due to potential litigation. The initial identification will be carried out by volunteers. There will be some supervision required. Any additional funds would be sourced from either working funds or the environment levy.